The likely absence of a dip in the tail-end of the yield curve helps tell you why the U.S. Treasury probably won’t be selling ultra-long bonds. While Steven Mnuchin, President-elect Donald Trump’s pick for Treasury Secretary, said he’d “take a look at everything” in response to a question about 50- and 100-year bonds, an analysis of the projected gap between yields on 30-year bonds and the longer securities signals investors won’t pay enough for the debt for it to make sense for the government. An upward sloping, or even flat, yield curve between the 30- and 50-year maturities means investors aren’t willing to reward the Treasury a price premium for the debt even though many desire the benefits of positive convexity, which helps enhance returns when yields fall. In the U.K., that’s an enticement that has helped 50-year gilts yield less that sovereign securities maturing two decades sooner. 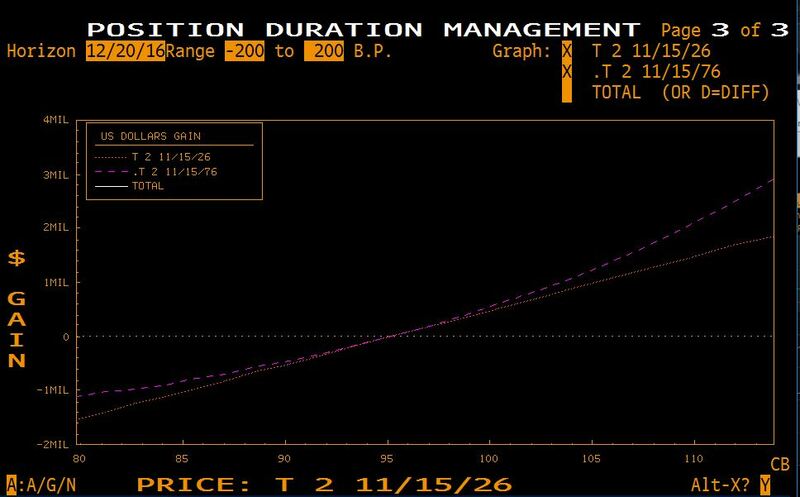 The Bloomberg’s Treasury spline model — which assumes constant forward rates into the future — implies a U.S. 50-year U.S. bond would yield 3.13 percent, almost matching that of the 30-year. While that’s a theoretical baseline, the Treasury doesn’t seem to expect the curve to kink downward due to positive-convexity demand, such as in the U.K. with its 50-year securities. The price-to-yield relationship for different maturities, as illustrated below, shows longer-term Treasuries posses more positive convexity, which enhances price gains when yields fall and curtails declines when yields rise. Treasury officials also doubt that demand for super long-term debt would be consistent beyond initial sales to enable them to continue their goal of regular and predictable issuance. 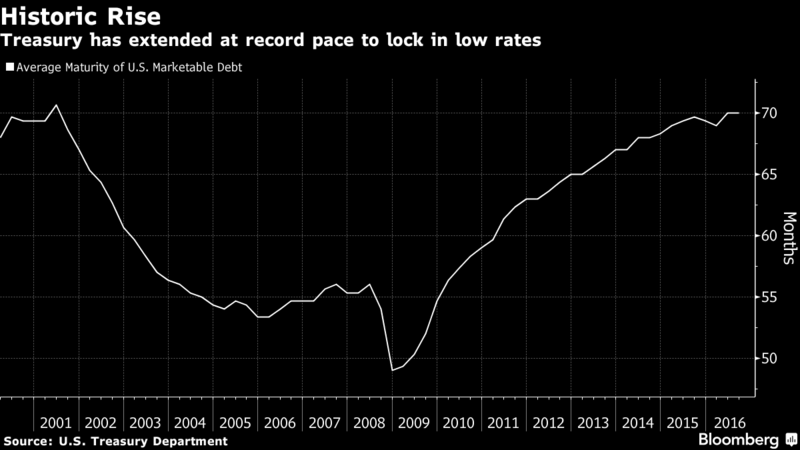 Since the financial crisis, Treasury officials have focused on locking in low borrowing costs to counter the effect when interest rates normalize. During that time, they have engineered the fastest extension of the average maturity of U.S. debt in history. In the U.S., ultra-long bonds would more likely mirror France’s schema, with a 50-year yielding about 0.20 percentage point higher than the 30-year, according to strategists at Deutsche Bank AG. This is in part because demand in the U.S. from pension funds — among the biggest buyers of long-term securities — isn’t likely to be a strong as the U.K. Adding to that is the reduced liquidity in the U.S. swap market beyond the 30-year maturity. For each one-basis point increase in yield, the price value of $1 billion worth of 50-year bonds would fall by $2.96 million, according to Bloomberg calculations using the interest-rate swaps market as a proxy. That prices adjustment figure falls to $2.17 million for the same move on an equal amount of 30-year debt. Dan Fuss, the 83-year-old vice chairman of Loomis Sayles & Co., said he recalls when a sharply rising yield environment in 1981 made it tough for Treasury to even sell 20-year bonds. That’s one of the reasons he doesn’t think the Treasury will introduce ultra-long bonds. Fuss said he wouldn’t be a buyer.